The 2016 Maserati Quattroporte is the flagship sedan of the Italian exotic automaker, and one that expertly nails the luxury/sports equation. Lesser rivals like the Mercedes-Benz S-Class and BMW 7 Series offer more power and newer technology, but neither can match the exclusivity and prestige inherent in the Maserati name. If you want a full-size luxury sedan with exclusivity, panache, power and exquisite style, the Maserati Quattroporte is hard to beat. With a price starting around $100,000, all this is can be yours at a price that's less than the famed trident badge may suggest. The downside of exclusivity is a smaller dealer network and a smaller model range. On the technology front, you won't find features like semi-autonomous driving aids or even Apple CarPlay in this exotic sedan -- in fact, just this year it's getting blind-spot monitoring and Siri assistant. Along with blind-spot monitoring, the Quattroporte finally gets a power-operated trunk. A new base model comes in the form of the rear-wheel-drive Quattroporte S. Also new are a harman/kardon audio system and collaboration with Italian fashion house Ermenegildo Zegna on interior design. The Quattroporte cabin is a sublime blend of leather, wood, chrome and optional carbon-fiber accents. The Maserati Trident is seemingly everywhere. In addition to analog gauges, the Maserati Quattroporte has a 7-inch TFT display in the instrument cluster and an 8.4-inch in-dash touch screen. The rear-seating area has ample legroom and can be configured to carry two passengers in individually sculpted seats instead of the standard 3-person bench. The new Zegna package, which runs $7,300 on V6 models and $1,600 on the GTS, features leather-grain seats and door panels and silk on the ceiling. Though long at over 207 inches, the Maserati Quattroporte sedan is well-proportioned. This 4-door luxury sports sedan is all strong curves, flowing lines and muscular but subtle bulges. Up front are Maserati's vertical grille and the Trident logo that turns unfamiliarity into instant admiration. Just aft the front wheels are the signature air vents, while the rear melds into a subtly snubbed design. Quad tailpipes hint at the power lurking under the hood, with the V8 GTS differentiated by a twin-trapezoid design versus the V6 models' twin-round outlets. The 2016 Maserati Quattroporte is substantial in both length and weight. Powerful engines, capable adaptive suspension and excellent Brembo brakes enable this full-size luxury sedan to ride and handle like a much smaller car. We applaud Maserati's conventional hydraulic steering assist, which delivers fantastic feel and responsiveness. There is a distinct performance difference between the two trims, although both the S Q4 and GTS display a smooth, comfortable ride under normal conditions. The all-wheel-drive (AWD) S Q4 has its power biased toward the rear wheels and only changes when wheel slip is detected. With its twin-turbo V6, the S Q4 feels balanced and responsive, but it's the Ferrari-sourced twin-turbo V8 in the GTS that really makes the Quattroporte a contender. Powered by its rear wheels only (RWD), the GTS is the choice for hard-charging drivers. The new Quattroporte S, meanwhile, appeals in both price and with its own rear-drive handling dynamics. With the introduction of the 2016 Maserati Quattroporte S model, entry into the lineup is now $7,000 less at a Manufacturer's Suggested Retail Price (MSRP) of $101,700 when including destination charges. The mid-trim S Q4 comes in at just under $110,000, and the V8-powered Quattroporte GTS starts at over $144,000. Options can swell the bottom line by thousands. By comparison, Mercedes-Benz's flagship sedan, the S-Class, starts under $97,000, the BMW 7 Series bows at just over $82,000, while a Jaguar XJ begins just over $75,000. Ultra-exotic sedans like the Bentley Flying Spur and Aston Martin Rapide S are over the twice the price. To be sure you're getting the best price, consult the KBB.com Fair Purchase Price before buying. Because of its exclusiveness, precise prediction of the Maserati Quattroporte's resale value is hard to predict. But like most high-end cars, even nominal depreciation equals tens of thousands of dollars. So what does $100,000 in Maserati land buy you besides the intangible envy of your neighbors? A base Quattroporte S includes leather interior, heated front seats, power-operated rear-side window shades, sunroof, 8.4-inch touch-screen command center with navigation, rearview camera, front and rear parking sensors, dual-zone climate control and bi-xenon headlights. The new standard audio system is a 900-watt/10-speaker harman/kardon with CD player, USB input and Bluetooth connectivity. There is a new-for-2016 Zegna interior -- available with seats in black, red or tan -- and a climate package that offers 4-zone control, heated rear seats, power rear sunblind, and heated wood-and-leather steering wheel. Ventilation is available for the front seats, as are power-adjustable foot pedals that make it easier to find the perfect driving position. Blind-spot monitoring is optional on base models and standard on the others. A real treat for rear passengers is the pair of climate-controlled seats with center console, while audio lovers with an extra $5,200 can opt for the Bowers & Wilkins sound system. Not only is this new trim level the lowest priced of the Quattroporte lineup, it's rear-wheel drive (RWD), which was previously available only in the top-line, V8-powered Quattroporte GTS. The combination of this model's lighter weight and RWD promises to make this Maserati lithe and very fun to drive. Depressing the Sport-mode button instantaneously instructs the 8-speed automatic to quicken its shift points, and the Skyhook magnetic suspension to firm up. The system also opens the exhaust flaps that normally remain closed until the engine reaches 3,000 rpm. The sound emanating from the exhaust is mesmerizing. 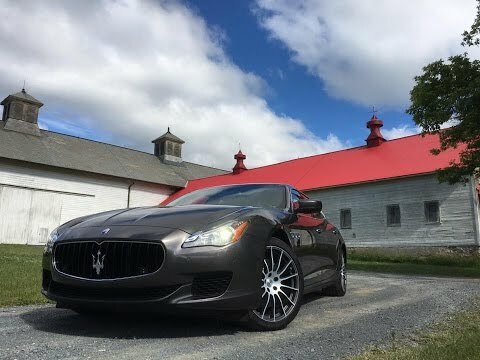 The 2016 Maserati Quattroporte features a choice of two twin-turbocharged powerplants, a 3.8-liter V8 in the GTS and a 3.0-liter V6 in the S Q4 and the new S. All models have the kind of throaty exhaust note and responsive performance that you'd expect from an Italian exotic. An 8-speed ZF automatic transmission channels engine power to the rear wheels of the Quattroporte GTS and S, and to all four wheels of the Quattroporte S Q4. All models are now equipped with an engine start/stop system. Note that the GTS model is affected by a $1,000 gas-guzzler tax. The 2016 Maserati Quattroporte is the flagship sedan of the Italian exotic automaker. Built to shuttle four or five passengers in splendor and speed, the Quattroporte expertly nails the luxury/sports equation. Of course, so do the Audi A8, BMW 7 Series, Porsche Panamera and Mercedes S-Class. In fact, many of those competitors have more power and technology at a lower price. But they don't have the Maserati name. Neither do they have this steed's style or exclusivity. In a Maserati, you'll turn heads and impress friends and strangers. For 2016, access to the club just went on sale with the new, roughly $100,000 Quattroporte S V6 base model. All-wheel drive can be had in the Q4, while the top-dog GTS is blessed with a Ferrari-sourced V8.